I drove through Yellowstone a number of years ago, shortly after the fire that had its way with so much of it. We were in a hurry, and I remember one scene as if it were yesterday, of new shoots emerging from scorched ground. I chose not to ask my family for permission for yet another photo stop, and I regret it to this day. Still, it lives in memory. This brings it very clearly to mind. Thanks, Linda! There’s nothing more remarkable than that first flush of growth after fire, regardless of the fire’s source. Of course, the ability to retain experiences in memory is remarkable, too. It’s one reason I sometimes choose to put the camera down, and simply watch. I’m glad this renewed some memories for you, too. Very moving Linda, image and poem. Interesting link thank you. 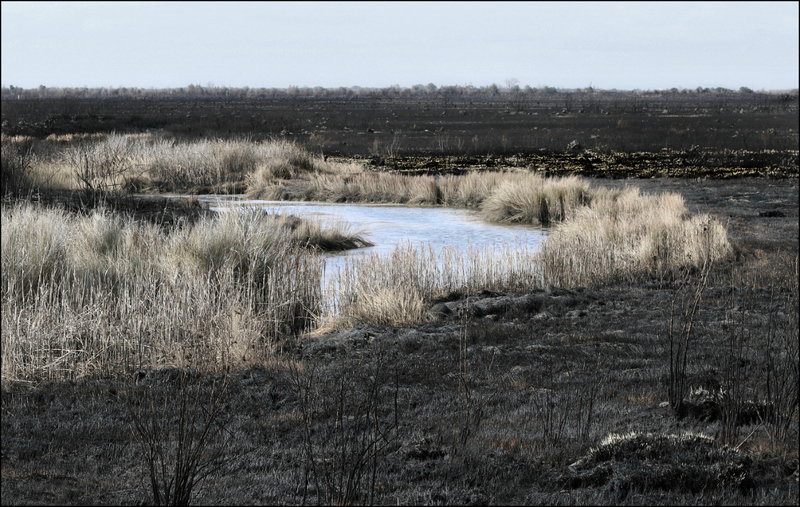 I was especially taken with the water coursing through the burned land. While stretches of burned prairie can be impressive, they can seem only flat, and dead. The moving water makes a good addition, I think. Wonderful poem and imagery, Linda. Thank you! I found the imagery appealing, too. It always delights me to find a poem like this tucked away in relative obscurity, and then to bring it out for other’s enjoyment. Your photo of vegetation that has made it through the burning reminds me of Hawaii’s kīpukas. At our NPSOT chapter meeting Monday night, our speaker focused on urban ecology. One of the issues he mentioned was fragmentation, which happens both naturally and in the course of urban development. Jed was raised in Hawaii, and he mentioned the “islands” formed by volcanic lava as one example of the natural fragmentation of an ecosystem, although he didn’t use the word kīpuka. It was the first time I’d heard the concept described. It certainly didn’t take long for it to show up again in your comment, and now I have a word for it. The way these things go, I expect to come across the concept or the word multiple times in the coming days. And I learned the word just days ago in a set of videos on geology. Who’d’ve thought a chance to use it would come so soon? Some might see devastation, but really, it’s all about renewal. Was this a prescribed burn? It looks just like our preserves when the burn crew is done with them, all ready to burst into fresh growth. I’ve read that land managers in California are realizing that prescribed burns will help alleviate the severity of wildfires and I am encouraged. The poem is beautiful. I wonder if I’ve come across excerpts of it somewhere? It sounded vaguely familiar. The poem’s brand new to me, as is the poet. I loved it at first read, and it wouldn’t surprise me to know it’s been excerpted in places. This is one area that California is really lagging behind and desperately needs to catch up, isn’t it? Of course if I were a land manager there and knew the stakes, I’d tremble at lighting the first match too. Wow. This is beautiful — and how perfect with your photo. Thanks, Jeanie. At the time I made those trips out to the prairies to see the burns, it crossed my mind that one of those photos would do well for Ash Wednesday. I was glad I remembered, and glad I found such a lovely poem to pair with it. Perfect Ash Wednesday post, Linda! I realize not every religion observes this tradition, but it seems appropriate at the beginning of Lent to do something outward to show us our need to do something on the inside so we’ll be ready to celebrate Easter. And did you know the last time Ash Wednesday occurred on Valentine’s Day was in 1945?? I didn’t know that 1945 was the most recent co-celebration, but it made me curious about the next time the two days coincide. Lo and behold, we’ll have Ash Wednesday/Valentine Day pairings again in 2024 and 2029. I’m pretty sure I’ll still be around in six years, so I’ve tucked my great idea for a post that honors both days in my files — all I have to do is remember that it’s there! But for now, it’s time for rest, reflection, and renewal. I’ve always thought of Lent as a quiet season, and it’s quiet tonight. In fact, the windows are open, and I can hear frogs, and night birds. I think they’re as happy as we are to have suddenly warmer temperatures, and some signs of spring. Great pic and I’m eager to see what photo you will post here when you go back, after new growth begins. This section actually was burned long enough ago that the grasses have come back, but there are other sections that were burned in the past month, so we’ll see what happens. My real concern is the roadside where I found unbelievable numbers of flowers three years ago. The county seems determined to mow, and there haven’t been flowers there for two years. This year, they may have mowed early enough that they’ll appear again — my fingers are crossed. Same problem here. The mowers come out too soon- before the seeds ripen but I’ve noted along Highway 6 going toward Marlin that the mowing was later. I have no idea if that was accidental or intentional. I hope it was a matter of some higher up, using good judgment. Wouldn’t that be wonderful? We seem to be a little short of good judgment generally these days, so every instance of it should be cherished. “We are stardust (billion-year-old carbon), we are golden” ~ Joni Mitchell. Just excellent! And the subdued image is perfect. There wasn’t any need to desaturate the photo for effect, but I did darken the water just a bit, and thought it helped to bring out the contrast between the flowing stream and the ashen fields. I’m glad you liked it. That is a striking image, Linda, and I enjoyed the poem very much. It’s been a real joy for me to watch the prescribed prairie burns, and then to watch their regrowth. They stand as a sign of hope in so many ways: some of which Richardson caught up in her poem, I think. I’m glad you enjoyed it, Lavinia. The image is surreal, and the poem is very spiritual. It’s hard to believe that new life involves the destruction of old, but it’s a law. That it is. We tend to forget how many cycles we live in simultaneously: not only dramatic ones, like birth and death, but daily ones, too — sunrise and sunset, the change of seasons, and so on. I’ve often thought that the normal cycles of life help us to understand that more dramatic, destructive events can be lived through, too. I suspect it’s one reason people love spring as they do.